For as long as she can remember, Alison has had two real dreams in life: to live on a goat farm and make delicious cakes. After graduating from culinary school, Alison worked in numerous award winning kitchens and even taught collegiate level pastry and management classes. But, after moving back to Northern Virginia, getting married to her high school prom date, and having two boys with amazing hair, it was time to make one of her dreams come true (the goats will have to wait). 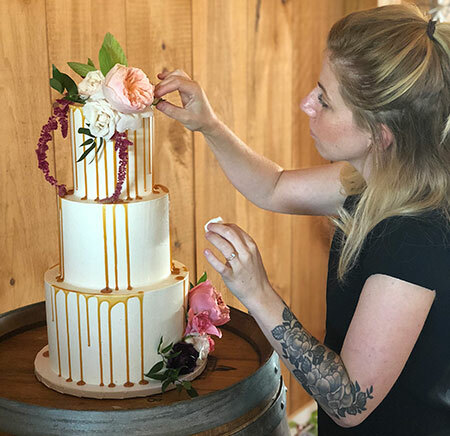 Alison is currently whipping up distinctive and delicious cakes as the chef and owner of Liberty Baking Co.
Liberty Baking Co. is an old-school American style bakery. Insisting on only using “the good stuff”, Alison uses high fat European butter, sour cream, cream cheese, and dutch processed cocoa to create rich cake layers and fillings. Using clean designs and natural elements Liberty Baking Co. makes each cake an original work of art that tastes as good as it looks. A cake is often the centerpiece of every great occasion. A heart-warming cake makes every one of these occasions even sweeter. Liberty Baking Co. is a small pastry studio that enjoys taking on only a handful of clients each week to ensure impeccable and personable service for each customer. Orders are taken directly through email with chef and owner Alison Friedman. Your inquiry is important to us. Please be patient and remember, we are a two-woman team (typically in the kitchen with messy hands). We will reply to your inquiry as soon as we can. In your inquiry, please provide as many details as possible including date, number of servings required, and any specific design features you like. It’s helpful for us to see images of the inspiration for your event including pictures of table settings, invitations, dresses, flowers, etc. Please send them to chef.alison.friedman@gmail.com or use the contact button above. In some instances, you may know the exact cake or sweet that you would like. We can work with your vision to create something spectacular, but please remember each artist has their own style, and we cannot guarantee that our work will match your image exactly. Additionally, because we work with fresh flowers, some concepts may need to be edited to meet seasonal availability. In other instances, you may only have a general idea or concept that will need tailoring. That’s perfectly fine – we love a creative challenge. Tastings are done all over the DMV area in cafes and restaurants, mostly just places where Alison likes to eat. Tastings cost $40.00 and include sample boxes for up to four guests. Each additional guest will cost an additional $6.00/person. One tasting box contains servings of 6 flavors of cake that are often too large for a single sitting. Mmmmm leftovers. During the tasting, we will discuss flavor options, sizing options, design details, pricing, and delivery. Price quotes can be provided while at the tasting by request. Each sweet detail will be typed up for your reference and review. Once every detail is set, Alison will send along the proposal and invoice. Each wedding event is to be paid 50% at the time of the proposal review to reserve the date, while the other 50% is to be paid the week of the event. Please note, the first deposit is nonrefundable up to 12 weeks before the event. Delivery is available for every occasion, large or small. Cakes that are 3-tiers or more, intricately designed custom cakes, and other sweet treats can be very delicate. They require specific temperature control, timed deliveries, and careful vehicle transportation. For this reason, we insist that we deliver such precious cargo. Venues within 20 miles of Liberty Baking Co. are priced at $50.00. Destinations outside of the 20 mile radius will be discussed during the initial consultation. If you need to reschedule your order, the initial deposit is transferable for 12 weeks prior to your original required date, and can be put towards the booking of a new date. After this allocated period of time, your deposit is no longer transferable or refundable, and will become forfeit. A full refund will be issued for any cancellation made formally in writing more than 12 full weeks prior to your required delivery date. If for any reason you wish to cancel your order after this period, we will offer a full refund less the initial 50% deposit paid. In the unlikely event that we are unable to complete your order due to personal circumstance or otherwise, we will offer you a full refund. © 2017 Liberty Baking Co.